How about an athlete who takes two cookies right before going for a game. Well, Brian Urlacher who plays pro-bowl for the Chicago Bears does this. He doesn’t take more or less of the junk, just two. One of the greatest defenders in the game of football. John Terry who plays for Chelsea FC has a lot of things he does before any game. First, he has a reserved seat for himself in the club’s bus, parks his car in the same packing space anytime and listens to just one song before the game. The weirdest thing the Chelsea legend does though it he urinates on the right side of the urinal before going for the game. Les Miles, the coach of LSA admitted to his behavior of having to chew the Stadium’s grass before a game. The Coach insists that the ritual helps him to feel like he is a part of the stadium and that it also humbles him. Michael Jordan, the world’s most renowned basketballer stayed true to his roots by always wearing the shorts he wore when playing at UNC underneath his shorts when playing at the NBA. This, he said, were his lucky shorts and are what may have helped him get to where he got to. To Tiger Woods, red is a power color, and that is why he wears a red t-shirt to every golf game he goes to that is scheduled on Sunday. He has done this since 1996. Christiano Ronaldo credits his scoring ability to the hair cut he does before each and every game. The football superstar makes sure that his hairdo is right before every game. There you go. 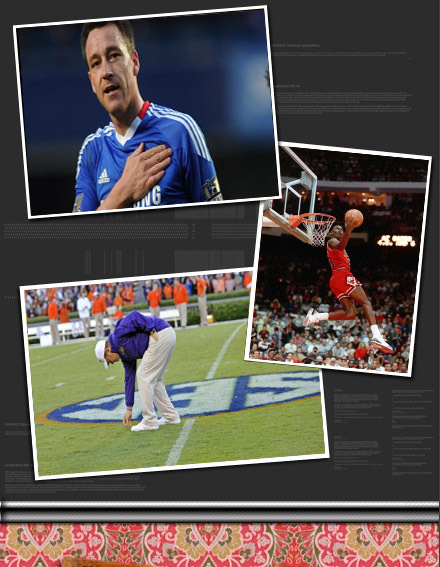 These are just a few of many existing rituals that sportsmen do just for the love of the games they play. Some of them may seem superstitious but who cares if it works for them!